Crotched Mountain's logo during the 1969/1970 season. Crotched Mountain, NH is making a comeback! Peak Resorts, based in St. Louis, Missouri will reopen Crotched around December 2003. For the first time, NELSAP will have the opportunity to cover a rebirth of a closed a ski area, and thus we are very excited!. We will post occasional updates on the progress of the reconstruction on the former ski area. Peak Resorts is excited to have us help promote the reopening. The Onset/Bobcat/Crotched West portion of the mountain is the only area slated to reopen at the present time. Please be advised that you can visit the area. The owners only ask that you do not get near any of the equipment on the mountain. Also, please stay out of any base buildings, and stay away from any construction. Otherwise, do swing by the area and check it out. If you have any historical Crotched Mountain pictures to share with us, just send us an email. 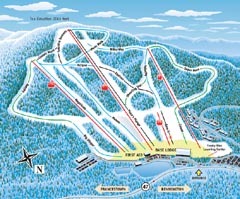 Please visit the new Crotched Mountain website by clicking here. Click on the trail map to the right to see what the new trails will look like! Looks like a space theme. Courtesy www.crotchedmountain.com. The following updates chronicle the area's construction. We have more photos "between" the periods listed below from NELSAP readers, and hope to post them. Two NELSAP readers sent updates on this date. Bob Caron took the following set of pictures of the area in Mid-September. Bob Caron took the following set of pictures of the area in Late August/Early September. Bob Caron took the following set of pictures of the area on August 2. Bob Caron took the following set of pictures of the area in late July. The first series of articles covers the plans of the mountain, and the current state of Crotched, as of August, 2002. Jeremy visited the area on August 8, 2002, and took plenty of pictures, and also met Resorts President Tim Boyd. We hope to totally update the rest of Crotched's history in the near future, including older pictures from our readers. Once the area opens, I'd like to have a few NELSAP ski trips there. 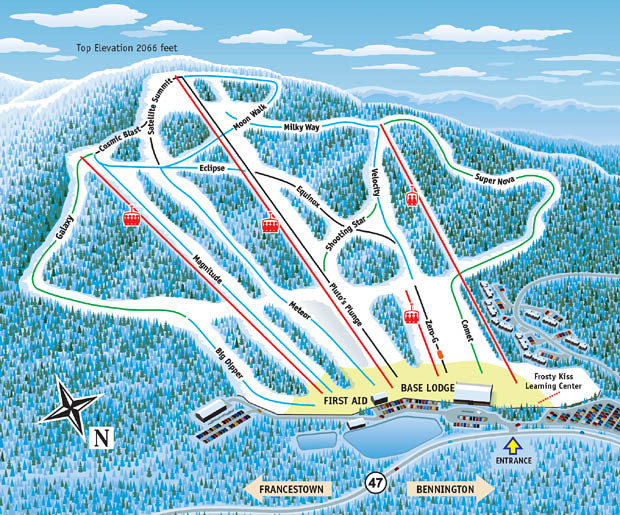 Be sure to tell every skier you know about this exciting project! Special thanks to: Dave Brooks, Nashua Telegraph, for breaking the news on this story and Tim Boyd at Peak Resorts for taking the time to help us out (and his son who took the time to show me around the mountain).